We all know that we want as many people as possible to read our blog posts (I’m assuming everyone knows how to WRITE a blog post already). If you spend hours crafting the greatest post you’ve ever written, and no one finds and reads that content — you have a problem. If you want your blog content to be found, you need a blog promotion strategy! There are those that say great content will market itself. I agree with Darren Rowse that there are elements of truth to that concept. But, as Darren says, the reality is that unless you have a considerable built-in audience, the chances are good that no one knows your content exists except you. Blog promotion is all about changing that and maximizing he chances it’ll get picked up by others. So, what do you do AFTER you hit the publish button to ensure your blog gets read? Post it on Twitter, with a custom, catchy headline. I admit I’m guilty of not customizing the title for Twitter very often (I have posts auto populate via Twitterfeed) – and David Gibbons continues to give me a hard time about it. Post it as a Facebook status update. This is where your close network spends hours and hours every day; maximize the chances they’ll see your blog post in their feed by posting it as an update – ideally, in the middle of the day. Submit your RSS feed to Outside.in and make sure to tag your post with the appropriate tag (only relevant if your post is locally focused). Especially in a market where Outside.in has media partners such as STLToday.com, I think you’ll find some decent traffic clicking through to your site. Get one of your close friends to submit it on Digg. Digging your own articles is frowned upon, and you’ll be less likely to get votes for it if you take that approach. Share your article on Stumbleupon. The traffic will be hit or miss and fairly unqualified, but it’s still worth trying. Use good blog posts (NOT every blog post) as a reason to touch base with your network. Be strategic about who you personally reach out to with each blog post. Don’t reach out to everyone with every blog post you are trying to promote. If you cover a range of different topics on your blog — for instance, real estate, tech, and global warming — you should have a list of 10 people in each of those niches that you can reach out to. Email them about more than just your blog post. Take a look at their blog and mention something they wrote recently, or something they posted on their Facebook or Twitter accounts. If you are close with the person, you likely already know something recent, but that’s not always the case. And I think it goes without saying that you should be interested in what they are doing; it’s not all about YOU. Include something to the tune of “any help in spreading the word or feedback you can provide would be appreciated” in your personal note. If they respond to your email, write a thank you email to them whether or not they wrote about your article. This is more important than you may think. If there is someone you consider influential and you know them (and they cover a topic relevant to your post), call them to catch up — and make sure you mention your recent blog post during that conversation. This both not only notifies that person of your post, but also helps you build a stronger long term relationship. Lastly, remember that you still have to write, record, or design great content if you want others to read it; don’t expect a crappy (or even mediocre) blog post to get picked up by others. Are there other things you do to promote your blog posts? Questions, suggestions, or observations – share them in the comments! This is step two on your journey… Have Fun!! 1. 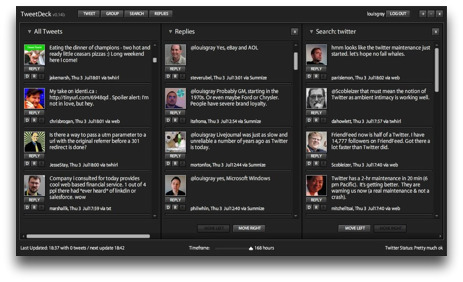 TweetDeck is a desktop Twitter and Facebook application. Like other Twitter applications it interfaces with the Twitter API to allow users to send and receive tweets, view profiles, and organize your Twitter friends into groups. 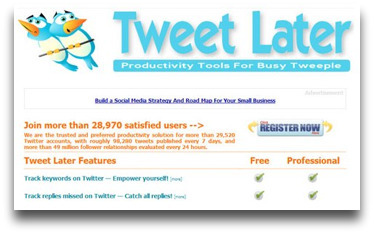 2.HootSuite is the professional Twitter client. 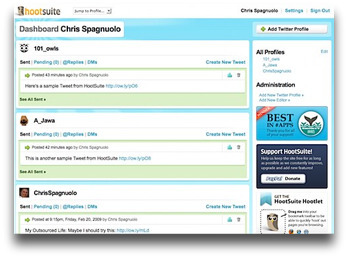 With HootSuite, you can manage multiple Twitter profiles, pre-schedule tweets, and measure your success. 3. Twellow‘s web site has huge database of Twitter users sorted nicely into categories! Very good way to follow and get some related followers. 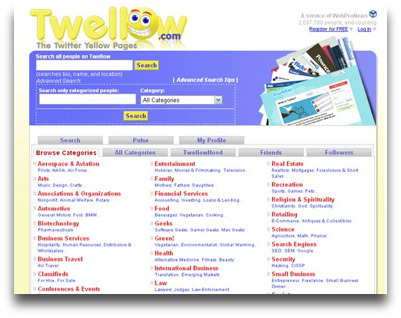 There’s many categories 3, Tellow is the Twitter Yellow Pages. 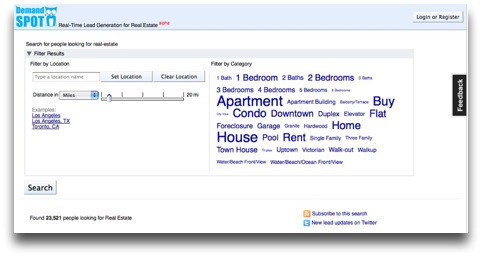 If you haven’t registered your Real Estate Twitter account on Twellow, it is time to do so. 4. 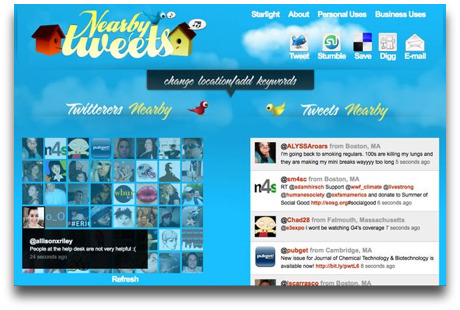 Nearby Tweets monitors the buzz on your business and local markets. 5. 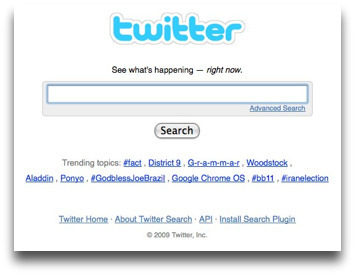 Twitter.com Search Yes, Twitter search. 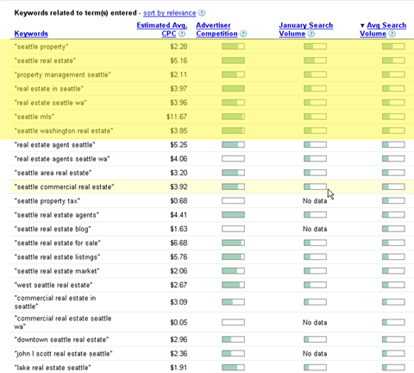 Learn all the ways to search for prospects. For example, if you enter in the twitter search box… near: 92660 house, you will get everyone who lives in that zip that has used the word house in their tweet. A valuable tool for agents. 6. TweetLater is really great tool where you can automatically follow people that follow you and you can submit tweets to be published at specific times. Very good and very effective tool for all Twitter freaks for sure. 7. Demand Spot is a Twitter mining tool that allows you to search (by keyword) and tweet people who are looking for homes to buy or rent in your local area. 8. 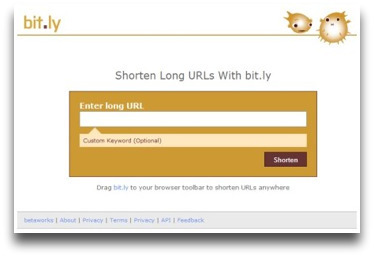 Bit.ly allows you to shorten share and track your links. 9. 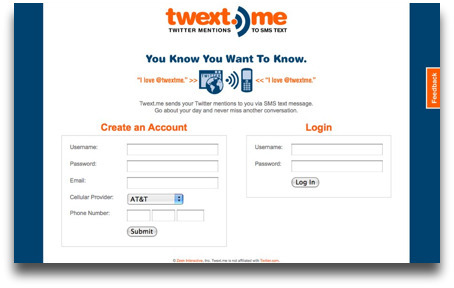 Twext.Me is a cool service by Jeff Turner that sends your Twitter mentions to you via SMS text message. Go about your day and never miss another conversation! 10. 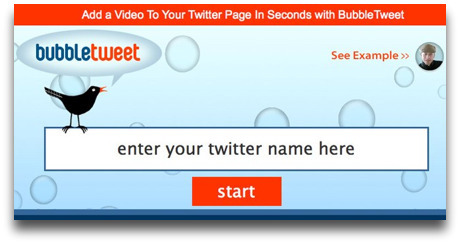 BubbleTweet adds a personalized video to your twitter account. Real Estate Marketing- Does Personal Brand just mean Being? At what point do we try so hard to twist everything into a marketing cliché that “simply BEING YOURSELF” is branding? Over the last few days, some the brightest people I know. People I really respect have taken positions on both the effectiveness of Social Media as a lead generator and whether a blog was lead generation or branding. These conversations irked every fiber of my being. I mean, I do this for a living…well. I have copious clicks to prove that Twitter and FaceBook drive traffic to Virtual Results websites and these sites, painfully configured to convert, create leads. So if my clients use Social Media to drive traffic to their VR website and the website convert this traffic to leads… This is not an opinion…This is MATH. I will not argue whether or not SM is lead gen, again. se·man·tics Pronunciation: \si-?man-tiks\ the study of meanings: a : the historical and psychological study and the classification of changes in the signification of words or forms viewed as factors in linguistic development. Yeah, semantics. You see, I believe that a Brand is a promise that you make to your audience. “I am the hardest working Realtor in California” is a promise, a brand. Personal branding is the process whereby people and their careers are marked as brands. It has been noted that while previous self-help management techniques were about self-improvement, the personal branding concept suggests instead that success comes from self-packaging. Further defined as the creation of an asset that pertains to a particular person or individual; this includes but is not limited to the body, clothing, appearance and knowledge contained within, leading to an indelible impression that is uniquely distinguishable. Personal branding often involves the application of one’s name to various products. For example, celebrity real-estate mogul Donald Trump uses his last name extensively on his buildings and on the products he endorses (e.g., Trump Steaks). So how is blogging branding? Well Rob Hahn, here gives the impression that any marketing created that does not target a key group of prospects is branding. Now don’t get me wrong. I have MAD respect for Rob. I hang on his every word… (and you should too.) But in this case? I disagree. Is simply Being, now Branding? Blogging is an effective marketing tool for agents, here are its benefits. Most of the benefits are either to help with Serps, create call to actions, or establish a relationship with your reader. Establish a Relationship… hah…branding? Lets dive in. Scenario One: If I am a door to door vacuum cleaner salesperson, and I knock on your door… I hear and see your 6 Persian cats… My conversation turns to, “I love cats. How many to you have?” Over the 20 minutes, we speak about cats, our lives, my job, your job, etc… I am creating a bond. I am creating a relationship. I am being me. Even if you tell me you are not in the market for a vaccum cleaner, and I come back every day for a year to speak to speak to you about your cats, until you are in the market… AM I BRANDING? NO. I am selling. Scenario Two: I tweet “We have had 93 days in a row of perfect weather in Laguna Beach.. You really should move here…” You go to my blog and see my post on Laguna Beach Weather. It has a call to action, “you really can afford it here… check out these homes for under $500K” Branding? Nope. Sales. So creating conversation, is not branding. And creating Business from that conversation is not Branding.. What is Branding? Best I can tell, this is the new description… Being You. But only if the person reading is not in the market for what you are offering. If they are? Lead Gen.
Just Not Buying this. Here is my advice. Stop Branding. BE Honest, BE Transparent, BE Consistent… BE. I think that maybe the Brokers just got frustrated or ran out of ideas,. Maybe they didn’t have the time during the “boom” to give better counsel… or perhaps they SIMPLY DON’T UNDERSTAND THE INTERNET. But frankly, this is really low-grade advice… Imagine yourself looking for a new shiny car.. A Prius, or even a Benz. You go to your favorite search engine, pause and breathe, and type in your search, p-r-i-u-s. You eagerly await the results and ta-da, there it is… three pages filled with sites advertising Prius…..salesman. “Please choose me to buy your Prius, I have been in the industry for 23 years. I was number one in Talooga County in 2004. I have 15 initials after my name, Phd, BS, Md, Esq, l-m-n-o-p… Look at my picture, don’t I look trustworthy? Oh, and here is my dog! Is this the actual results you were looking for? You are probably clicking through these sites faster than a 14 year old playing a video game. I want to see a car, I want see deals on a car, I want to see the Windshield Replacement Cost and all the probabilities of getting in an accident, I want to see information about the car. I want to find the right car. I want see prices on this car. Convince me to buy THIS car and then I will THINK about who I want to buy from. Enter Web 2.0… How about giving your searchers what they are looking for? They are not looking for you… They don’t care about you! They want your product. Real Estate Searcher come to the Internet to learn about houses. Check out houses, look at the prices of house. They come to get information (from you) about neighborhoods, architecture, market trends. They even come for advice…. about houses, housing and all things Real Estate. So, now you know what they want… Is your site offering it? Do you have the best IDX in your market. Can they see inventory with 2 clicks, one click, NO clicks. Do you have pertinent market information. Pertinent = timely and Original. Do you have community information. Not canned, regurgitated HOA information, but meaningful, valuable, original information. What would YOU want to see in a site… Make a list. If you were moving to Talooga county in six months, what would the site look like that YOU WOULD WANT TO USE…. Simply search for sites that carry the content you crave and subscribe to them in your Google Reader. Then list all unread and power short cut through them. Get ready to replace your keyboard whent the “J” pops off!! Do Realtors Know…What they dont know? As I travel to seminars and speak to Realtors , I am running into a problem that I never actually considered. The REASON, I thought, that Realtors (in general) werent effective in realizing income on the Internet was that that they didn’t understand how. Understandable. All realtors should be as good at selling houses as the The Mayo Home Team, or at least that’s what a person expects when hiring one. Internet marketing is a whole cottage industry away from Real Estate. Perhaps they were trying, but just missing the mark. The actual problem, I now see, is more systemic than that. Most Realtors dont know what they dont know. The Idea that a Website is should be built to create REVENUE and not a brand? I didn’t know that. The concept that I can create a website that APPEALS to my searchers and creates a DESIRE to self-identify? Really, I didnt know. The theory that I can actually track my visitors progress through my site and see which parts they enjoy and which they dont? and that I should actually build the site THEY WANT? I didn’t know that I didn’t know that, either. Make sense? Who knows…. stayed tuned.